Give In To Your K-Pop Guilty Pleasure--Grab The Latest Ish Of Sparkling 2! Cosmo's sister publication, K-Pop mag Sparkling, just released their second issue this summer! Read up on the latest about 2NE1, Super Junior, and more! 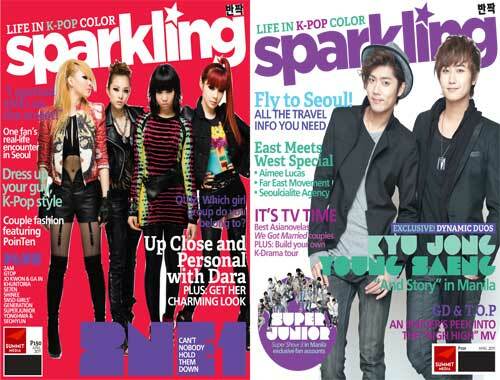 Sparkling offers everything K-Pop-tastic, from a special coverage on Super Junior's spectacular SS3 show in Manila to a super exclusive interview with SS501's Kyu Jong and Young Saeng, close encounters with 2NE1, Se7en, f(x)'s Luna, and an up close and personal story on Sandara Park. Fangirls and fanboys are sure to go gaga over their fave K-Pop groups and stars, with features on Kyu-Saeng, GTOP, Jo Kwon & Ga In, SHINee, SNSD Girls' Generation, Yonghwa & Seohyun, and more! Those looking to chill in front of the tube will enjoy the mag's rundown of the best Korean horror flicks and the cutest, most swoon-worthy K-Pop pairings today. Your favorite Asian-American acts get a special preview too, with Far East Movement, YG's favorite Filipina choreographer/dancer Aimee Lucas, plus a sneak peek into what goes on behind the scenes in Seoul's exciting club scene. Our special travel section features everything you'll need to know about traveling to Seoul—from how to book that ticket to scoring a visa, including which destinations to check out and how to make the most of Korea's most romantic love holidays. Sparkling's fashion and beauty pages are also loaded with K-Pop get-ups for both guys and girls, fresh new hairstyles to try, and the coolest streetwear to hit both Seoul and Manila. Grab Sparkling's latest ish, in stands now!